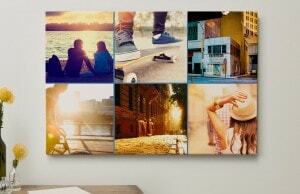 A photo collage for your canvas, aluminium, acrylic or mounted print! 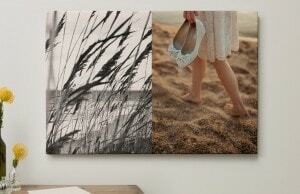 Do you find it difficult to choose just 1 photo for your wall art? With our new collage feature that difficult decision is a thing of the past! Bring your favorite photos together on your wall and tell a story with a photo collage on canvas, aluminum or acrylic prints…. Use your wonderful memories of that unforgettable holiday or cozy family weekend away! The process couldn’t be simpler; you don’t need to be an artist to make your collage. 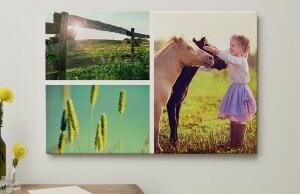 With our simple online program, you can transfer your pictures beautifully together on your favorite wall art! Select any sized canvas, aluminum, acrylic or mounted print, determine the number of photos you’d like, and choose your different format. You can create space between the pictures by adjusting the margins – you decide how big these margins are and therefore how you wish to present your collage. You can also choose from our large collection of backgrounds to give the empty space colour. Capture your memories and bring your favorite photos together on your wall; give a photo collage gift for a birthday, Valentine’s Day, Mother’s Day or Father’s Day! 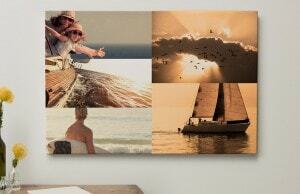 Go ahead and make your own photo collage on a canvas, aluminum, acrylic, or mounted print. A great gift, excellent quality. Would use again.